Recently the Dutch magazine PRINTmatters published an article in relation to the discussion about the report “European Printed Packaging Trends” by Smithers Pira during the “Shaping the future of Print” packaging conference on 21 February in Brussels. 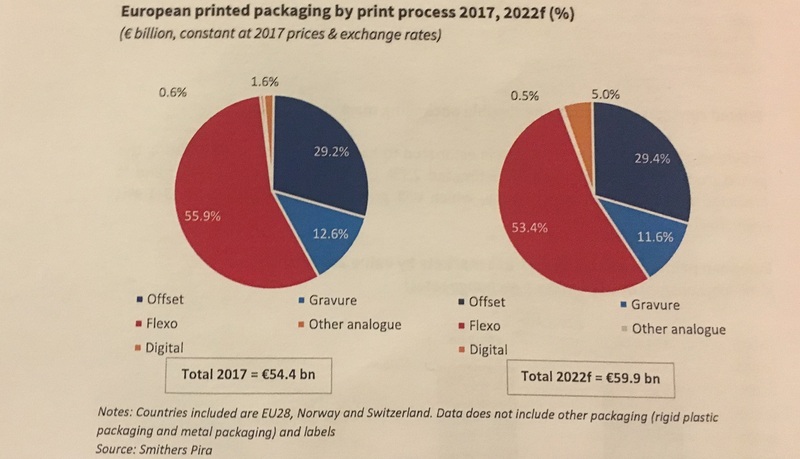 One of the main conclusions in the report is that, in the market for printed packaging, the dominant flexography technique loses a market share of 4.5% until 2022, while rotogravure loses 8%. Digital printing grows to 5% market share in 2022, while offset printing remains stable. On average, 70% of all packaging in Europe is printed. Only 20% of industrial flexible packaging is printed, while cardboard packaging is printed in 90% of the cases. The market for printed packaging is growing in Western Europe by 2% per year. 63 billion euros are currently being sold in this market in Western Europe. In Eastern Europe, this market is growing by 3.5% per year to nearly 10 billion euros in 2022. According to Smithers Pira, we see interesting differences between 2017 and 2022 when we look at the printing techniques used in printed packaging. Flexography remains the dominant printing technique, but loses market share in digital printing. The same applies to rotogravur. The market share of flexography is falling from 55.9% to 53.4%. This absolute decrease of 2.5% is relatively 4.5%. It means a relative loss of market share of almost 1% per year. Engraving is falling faster: from 12.6% to 11.6%, or a relative loss of market share from 8% in five years. The profit on print technology therefore goes to “digital printing”: the market share has more than tripled, because it rises from 1.6% to 5.0%. Offset printing can maintain and even strengthen its position on the market for printed packaging. The market share will increase between 2017 and 2022 from 29.2% to 29.4%. Why is offset ideal for printing flexible packages? Offset printing has many advantages, such as high print quality and high speed printing. With offset printing job change overs are very shot and printing plates can be produced at low costs; this makes offset printing very profitable for short-run jobs. Offset printing technology uses solvent-free inks that meet international food safety standards and the used coating and drying solutions do not emit VOCs (volatile organic compounds).